Throughout the past ten years of The Passionate Foodie, I've been an ardent advocate of Portuguese wines. They are delicious and diverse, with hundreds of indigenous grapes, often mixed together into intriguing blends. They are food-friendly, excellent for pairing with a wide range of cuisines. They also are often great values, presenting plenty of inexpensive and tasty options. I could go on and on, such as discussing the wonders of Port and Madeira, but I want to present a few recent stats to show the growth of Portuguese wines in the U.S. In 2016, exports of Portuguese wines to the U.S. reached about 1.56 million cases, an increase of about 90,000 cases from the previous year. Between 2010 and 2015, the value of Portuguese table wine exports grew by 18.4% while volume grew by 8.2%, indicating that more higher priced wines were exported to the U.S. The best selling Portuguese wines in the U.S. are those from the Vinho Verde region, consisting of approximately 50% of all imports. There is plenty of room for growth of Portuguese wines in the U.S., and it is clear consumers need to learn more about wines from other Portuguese regions, such as the Douro, Dao, and Alentejo. Each year at the Boston Wine Expo, I make sure to sample some Portuguese wines, always stopping by the tables of LGL Imports. 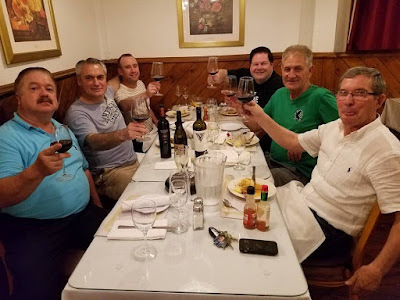 LGL Imports (Luiz’s Grocery & Liquors, Inc.) is a family owned company that was established in 1977, and began importing Portuguese wines and spirits in 1979. Several years ago, I met Luis Oliveira, whose father started the company, and Luis is carrying on that business. During these past years, a number of wines from LGL Imports have ended up on my year-end Top Ten lists. Their wines have often presented some amazing values, including even some wines that cost under $10! Plus, they have some compelling wines that are higher end too. Recently, Luis invited me down to Fall River, to taste some wines at their warehouse, and then to dine out at a local Portuguese restaurant, drinking more of their wines. It was an excellent evening, with plenty of amazing food and wine, as well as interesting company and conversation. It was plenty of fun, and if I didn't have to face an hour drive home, I might have stayed up all night drinking with them. Luis told me that Azoreans hate to end an evening, and they all would have continued drinking until the morning arrived. I don't often get to Fall River but maybe that should change, especially because all of the Portuguese restaurants. 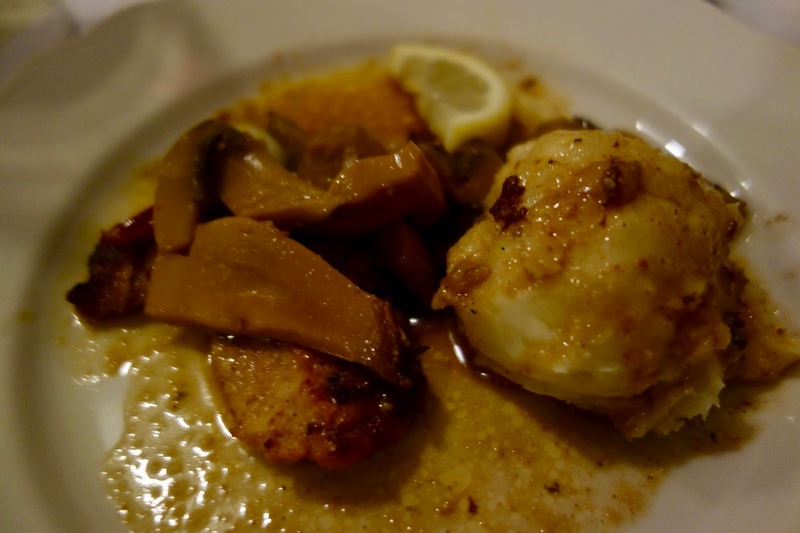 We dined at Terra Nostra, a casual spot that has been around for nearly thirty years. The current owner is Gus Oliveira, who purchased the place about 14 years ago. I met Gus and he was very pleasant and personable. It was obvious from observing him during the course of the evening that many of the customers must be regulars as they all seemed to know and like Gus. This is clearly a popular neighborhood spot. A great crew of guys. Gus, the owner, is the first person on the left side of the picture, and he is seated next to Luis. We didn't lack for food or wine. As soon as I walked into the restaurant, I was immediately taken in by the glass-cases of wine just inside the entrance. 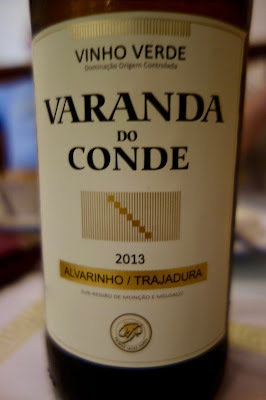 It indicated to me that this restaurant was serious about their wine, that they wanted to showcase Portuguese wines. On the other side of the cases is a small, fully stocked bar, and there is also another set of wine shelves and shelf-displays further inside the restaurant. There is a homey and welcoming atmosphere in the restaurant. The Wine List is primarily Portuguese, with only about 12 California wines (big names that are pricier). You'll find about 50 Red Wines (most under $30/bottle), 13 Whites ($16-$25/bottle), 10 Sparkling Wines, and 4 Rosé Wines, as well as Ports & Madeiras. They carry numerous wines from the LGL Imports portfolio. Overall, there is plenty of diversity on the wine list and the prices are extremely reasonable and affordable. The Food Menu is equally as diverse and affordable. On the menu, you'll find: Appetizers, 11 choices from $6.95-$10.95, such as Pasteis de Bacalhau (Cod Cakes); Soup/Salad, 2 Soups & 1 Salad, all at $3.50, such as Calo Verde (Green Kale Soup); Fish, 4 choices from $11.95-$17.95, such as Filetes Dourados (Golden Fish Fillet); Seafood, 3 choices from $11.95-$16, such as Arroz de Marisco (Seafood Rice); Steaks, 7 choices from $11.95-$18.95, such as Bife a Portuguesa (Portuguese Style Steak); and Chicken, 4 choices from $10.95-$13.75, such as Alentejana de Galinha (Chicken Alentejana). Essentially, everything is under $20, making this an affordable destination for most anyone. They also have a number of daily specials and take note of the top of the board, which states, "We serve fresh potatoes and vegetables cut daily!" We began the evening with an Azorean Cocktail, made with Maracuja Do Ezequiel, an Azorean passion fruit liqueur, plus some fruit juices. Though it was a little sweet for my preference, I enjoyed the blend of its fruit flavors and can easily understand its popularity. I think this would also work well as a frozen cocktail. 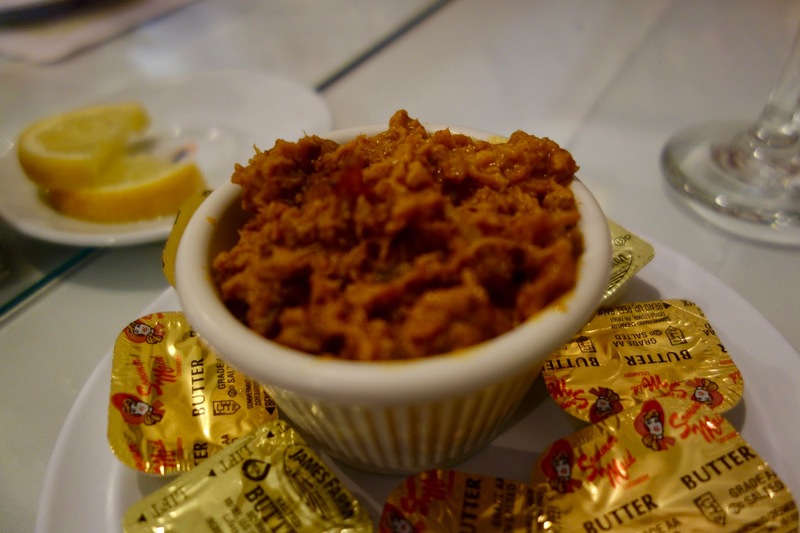 The meal began with a delicious Pate, creamy and flavorful, earthy and spicy. We had a basket of fresh rolls, and I smeared the pate atop the bread, making for a tasty start to the dinner. We also had a Fresh White Cheese ($4), a home-made cow cheese, that was also creamy, with a nice, clean flavor. Our first wine was the 2013 Varanda do Conde Vinho Verde, a blend of 70% Alvarinho and 30% Trajadura. Bright, clean and crisp, with pleasing notes of lemon, citrus, and mineral hints. An excellent aperitif wine and a perfect summer sipper, it also pairs well with seafood and cheese. The next course was the Chouriço a Bombeiro ($6.95), a Flamed Chouriço, and you can see the hint of blue flames below the sausage. The Chouriço, with a nice char, was tender and moist, smoky and spicy. I could have made a meal of just a couple Chouriço. Highly recommended! The Ameijoas a Bulhao Pato ($9.95) was a dish of Little Necks steamed in white wine, garlic, and olive oil. Tender clams in a compelling broth. One of my favorite parts of this type of dish is the broth, hoping for something delicious in which I can dip a crusty bread. This dish didn't disappoint in that regard, presenting a flavorful broth with plenty of garlic. Also highly recommended. One of the Specials was a Cow's Leg Stew ($12), which might not sound appealing but you really need to taste it. The savory stew had plenty of veggies and fatty pieces, bones and marrow of the cow. A bit chewy, the fatty pieces still possessed plenty of flavor, probably sopping up some of the gravy. 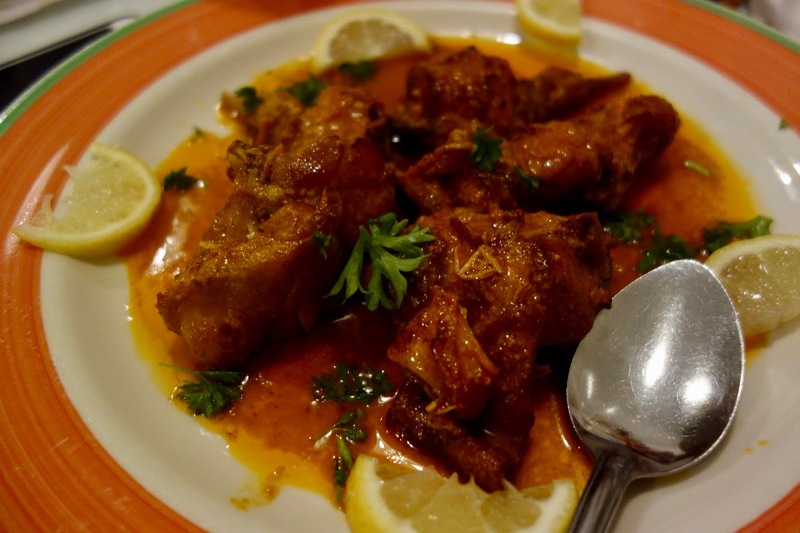 It is a hearty dish and you just need to be a little adventurous. Another Special was the Lapas Grelhadas ($14), grilled Limpets, which are a type of sea snail with a single shell. They are a speciality in the Azores and Madeira, and I've never tasted them before, and don't recall ever seeing them on a menu either. They almost look like a slice of sausage, roughly circular, and were a little chewy, with a briny taste. Definitely the bounty of the sea, enhanced by some lemon and I believe some garlic too. 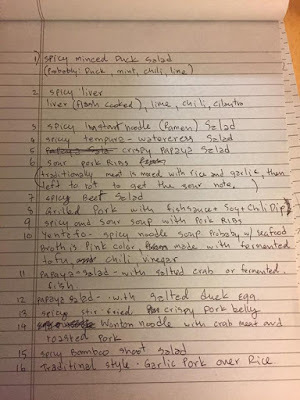 A very interesting dish and I would order them again. Our next wine was the 2015 Adega De Borba White, a blend of 70% Arinto, 15% Alvarinho, and 15% Verdelho. With an alluring aroma, the palate presents with delicious flavors of apple, citrus and even a little tropical fruit and a hint of oaky spice. Good acidity, a pleasing finish, and a nice balance make this a very good wine. 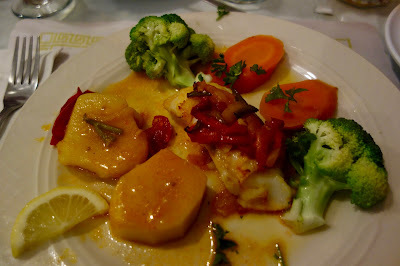 The Bacalhau na Brasa ($17.95) is a charbroiled Cod sautéed in onions, garlic and red pepper and served with olives, boiled potatoes and broccoli. The Cod was superb, flaky, tender and flavorful, with a nice light sauce and fresh veggies. The next wine, pictured on the left, was the 2013 Caves Velha Serradayres Reserva, a blend of Syrah, Touriga Nacional, and Castelao. It is smooth, with restrained tannins, and plenty of black fruit flavors, with a hint of cherry. It also has some mild spice notes and would be best served with a hearty dish or meat, from a burger to grilled ribs. 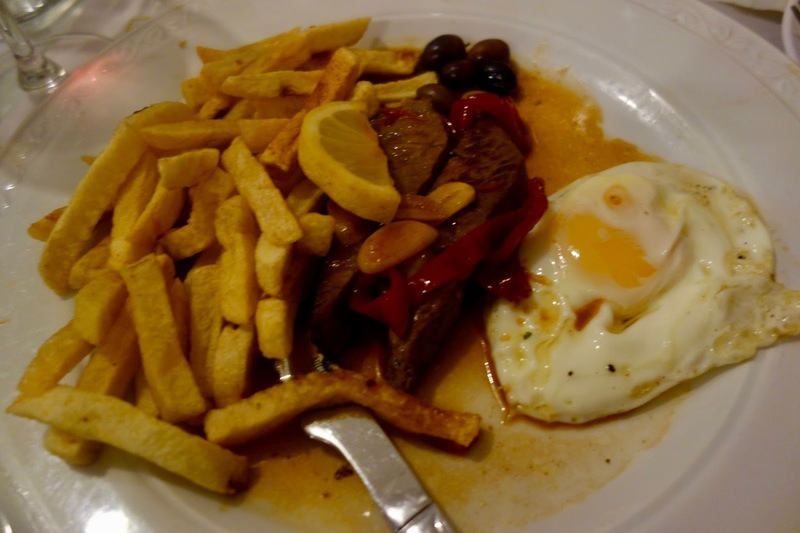 The Bife a Sao Miguel ($11.95) is St. Michael's Steak, a top round steak with a wine sauce, fresh garlic, pepper, French fries and an egg. Cooked medium, the steak was good, enhanced by the egg yolk and a side of hot sauce. The Fries were crisp and fluffy inside, a nice addition to the plate. Maybe my favorite dish of the evening was another of the Specials, the Roasted Rabbit ($14), which was tender and moist, flavorful and with a crisp coating. The sauce enhanced the rabbit and I could have consumed the entire dish on my own. I love rabbit and this certainly was one of the best rabbit dishes I've had in some time. The 2013 Adega Borba Reserva is a favorite wine of mine, one I've tasted on multiple times. A blend of Aragonez, Trincadeira, Castelão and Alicante Bouschet, the wine spends about 12 months in French oak, and then another 6 months in the bottle. As I've said before, "this is a delicious, complex wine and an excellent value. Though it is a powerful wine in some respects, that power is restrained within a velvet glove, presenting a silky smooth taste. There are lush black fruit flavors, plenty of intriguing spice notes, and some exotic herbal accents. This is another wine which would benefit from pairing with meat dishes. It is an impressive wine and one I highly recommend." Our final savory dish was the Lombinhos Na Brasas ($11.95), a Grilled Pork Tenderloin with a mushroom sauce. Delicious and tender pork, with an earthy sauce. The 2012 Montes Claros Garrafeira is a blend of Trincadeira, Aragonêz, and Tinta Caiada, and spent a year in the barrel and then 30 months in the bottle. It is a deep and bold red wine, with rich black fruit flavors and a prominent streak of chocolate. The tannins are restrained, presenting a silky mouthfeel as well as a lengthy, satisfying finish. The final wine was the 2013 Vallegre Vinhas Velhas Reserva Especial, a blend of Tinta Amarela, Touriga Nacional, Touriga Franca, Sousão and Tinta Francisca, from 60+ year old vines. It had been decanted that evening and presented as deep and dark, complex and smooth, spicy and tannic. Concentrated flavors of Rich ripe plum and flavors, with hints of chocolate and leather. So much going on in this wine, it is sure to impress. Highly recommended. For dessert, we ended with Grilled Pineapple, which was soaked in Port, Passion fruit liqueur, and anise. It was so juicy, with an interesting blend of tropical fruit flavors and a hint of anise. Even those at the table who hadn't wanted any dessert were compelled to have some of the pineapple. A fine way to end the evening. Terra Nostra impressed, with plenty of superb dishes, and presents an excellent value as well. The wines paired very well with the various foods, reinforcing my passion for Portuguese wines. I owe big thanks to Luis and friends for such a fun and tasty evening, one I hope to repeat again in the future. If you are ever in the Fall River area, I strongly recommend you check out Terra Nostra. 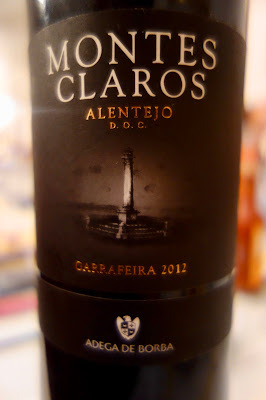 And I also strongly recommend you drink more Portuguese wines, and look for those from LGL Imports. "As I've said repeatedly before, Alsatian wines are generally not on the radar of the average consumer but they should be. They can often provide excellent value and taste. They are enjoyable while young but can also age well. They can provide a sense of history, as well as showcase state of the art wine making. At their most basic though, they are delicious." Wine exports from Alsace to the U.S. have increased by about 24% since 2011. The U.S. is currently the 3rd largest import market by value though there is still plenty of room for growth for Alsatian wines. As summer approaches, now is a great time to familiarize yourself with some of the young, fresh white wines from Alsace, perfect summer sippers. Let me present a couple examples, value white wines that deliver on taste. The Dopff & Irion winery has its ancestral roots hundreds of years in the past, back to 1574, and the Dopff family were also the first, at the beginning of the 20th century, to create sparkling wines in the Alsace region. In 1945, René Dopff took over the reigns of the winery, breaking away from some of the old winemaking techniques and giving precedence to terroir over grape variety. In this direction, he split the vineyard at Château de Riquewihr into four estates, naming them Les Murailles, Les Sorcières, Les Maquisards, and Les Amandiers. Each estate was dedicated to a specific grape variety. The total estate ranges across about 27 hectares, a large estate compared to the myriad of tiny vineyards in Alsace, often less than one hectare. I previously enjoyed the Dopff et Irion NV Crémant D'Alsace Brut Rosé, which made my Top Ten Wines Over $15 (and Under $50) of 2014. Made from 100% Pinot Noir, I likened it to a dish of strawberries and cream. Though dry and crisp, there was a rich creaminess to the wine, with plenty of delicious red fruit flavors, including plenty of strawberry. Complex and with a lingering finish, I found this to be a compelling wine, as well as an excellent value for the price. I've now tasted two other Dopff et Irion white wines, and they too are compelling and delicious, excellent value wines. The 2015 Cuvée René Dopff Pinot Blanc ($12.99) is produced from 100% Pinot Blanc, sourced from 300 selected vine-growers. The wine sits on the lees for about 4 months, is then filtered, and sits in stainless steel for several months before bottling. With a light golden color, it has a delightful fruity aroma, and on the palate, there are bright notes of peach, citrus and lemon. It has a rich mouthfeel, with a nice crisp acidity, and a clean finish. It is an easy drinking, but not single-note, wine and a very good value at this price. This would be delicious on its own while sitting outside though it would also pair well with seafood, light chicken dishes, and cheese. The 2015 Cuvée René Dopff Crustacés ($12.99) is a blend of 80% Sylvaner and 20% Pinot Blanc, sourced from 300 selected vine-growers. The wine sits on the lees for about 4 weeks and sits in stainless steel for about six months before bottling. This wine had a slightly brighter golden color than the Pinot Blanc but had an equally delightful fruity aroma. On the palate, it is crisper and leaner, with delicious apple and citrus notes, a backbone of minerality, and a pleasing finish. Like the Pinot Blanc, this wine is an easy drinking, but not single-note, wine and a very good value at this price. As the label notes, this is an excellent wine for crustaceans and shellfish. I would love to pair this with a plate of oysters, shrimp cocktail and a chilled lobster tail. When you seek out summer white wines, think Alsace. And the wines of René Dopff are a great Alsatian choice. In the movie Sudden Impact, Inspector Harry "Dirty Harry" Callahan stated, "Nobody, I mean nobody puts ketchup on a hot dog." When Anthony Bourdain asked President Barack Obama whether you should put ketchup on a hot dog, he replied, “It’s not acceptable past the age of 8." The National Hot Dog & Sausage Council also has declared that, "Don't...Use ketchup on your hot dog after the age of 18." In Chicago, they are especially virulent against the use of ketchup on hot dogs. Start a conversation on social media about ketchup and hot dogs and you'll hear many adamant, and even vehement, admonitions that you should never put ketchup on a hot dog. It can be a divisive topic, one filled with emotion, and will likely come to the forefront once again as the summer season nears, and backyard grilling begins. Last week, I was involved in a Facebook thread which raised the issue of hot dogs and ketchup, and it spurred on today's Rant. Contrary to the haters, I like ketchup on my hot dogs and I'm here to defend my stance and shatter the myth. When it comes down to it, the primary reason for the opposition to the use of ketchup on a hot dog falls apart when the facts are properly considered. Why so much hate for ketchup on hot dogs? At its heart, the most commonly stated reason is that ketchup is too sweet. However, that reason fails to be convincing with further analysis. First, there are numerous different types of ketchup on the market, with varying degrees of sweetness, including some which are far more savory. Thus, you can't generalize about ketchup because of its diversity. Second, many people approve of chili on hot dogs, yet they don't seem to realize that ketchup is an ingredient in a number of chili recipes. You might then have ketchup on your hotdog and not even realize it. However, chili is considered an acceptable hot dog topping, despite potentially containing ketchup. However, for the most compelling argument, we must look at the famous Chicago-style hot dog, especially that the city is so strongly anti-ketchup. Their hot dog is topped by a mound of ingredients, including yellow mustard, chopped white onions, green sweet pickle relish, a dill pickle spear, tomatoes, pickled sport peppers, and celery salt. With all those ingredients, can you really appreciate the hot dog itself? The numerous condiments seem to be the star of such a hot dog. In addition, and most importantly, this Chicago-style hot dog generally contains more sugar than a hot dog covered with just ketchup! It seems rather disingenuous for Chicagoans, and others, to complain that ketchup is too sweet yet their own famous toppings present even more sugar. Let's consider the sugar levels of a few toppings. In general, ketchup contains about 3.5-4.0 grams of sugar while sweet relish has about 4.0-4.5 grams of sugar. So why is sweet relish acceptable, despite its high level of sweetness, while ketchup is disdained? It makes no logical sense and destroys the argument that ketchup is too sweet for a hot dog. In addition, the average tomato contains 3.0-3.5 grams of sugar, making it the second sweet ingredient on the Chicago dog. Plus, Vienna sport peppers have about 2 grams of sugar and dill pickles have about 1 gram of sugar. meaning there are three sweet ingredients. That means a Chicago dog could possess three times the amount of sugar found in ketchup alone. The opposition to ketchup as being too sweet on a hot dog clearly falls when you look at it rationally. The famous and well-accepted Chicago-style hot dog is much sweeter than a hotdog merely slathered with ketchup. Since the sweetness argument has been put to rest, what other complaint can you have about the use of ketchup? In the end, we also have to remember that this is just a simple hot dog. It isn't haute cuisine. It commonly includes meat trimmings and fat, spices and preservatives. So what's the big deal about what some people choose to put on it? Why be a snob about putting ketchup on such a plebian food? Get off your high horse about what you think is an acceptable condiment for a hot dog. Ketchup isn't the villain so many claim it to be. Would you be willing to place the fate of your whiskey distillery on the result of a horse race? Most distillery owners would be unlikely to take such a great risk but it has allegedly happened before, when an Irish whiskey distillery was offered as a bet upon the Irish Oaks horse race. It all began in the town of Tullamore, located in County Offaly, which is situated roughly in the middle of Ireland. Tullamore is known as the site of the first air disaster, reaching back to Tuesday, May 10, 1785, when a hot air balloon crashed, setting off a great fire that destroyed approximately 130 buildings, including a military barracks and a tobacco factory. After that disaster, Tullamore created a new coat of arms, depicting a phoenix rising from the ashes, reflective of their reconstruction after that massive fire. We then jump forward, to 1829, and the founding of the Tullamore Dew Distillery. Eventually, this distillery would be placed on the line, a bet on a horse race. Would it be lost because it's favored horse couldn't get it done? Recently, Redstone Liquors, in Stoneham, hosted a Tullamore DEW Irish whiskey tasting that was led by Kate Shaughnessy (pictured above), the Boston Brand Ambassador for Tullamore DEW. Kate, a native of Ireland with a delightful lilt to her voice, has been working for Tullamore since last October. She led us through a tasting of five whiskies, also relating the fascinating history of the distillery. She was personable and informative, and everyone present seemed to enjoy the tasting event. The Tullamore DEW distillery was originally founded in 1829 by Michael Molloy, eventually being passed down to his nephew, Bernard Daly and then, in 1887, to Daly's son, Captain Bernard Daly. In 1862, when Bernard Daly was in charge of the distillery, he took on Daniel E. Williams, who was only 15 years old, and put him to work on the malt floor. Over time, Daniel worked his way up in the distillery, taking on greater and greater responsibilities. Captain Bernard Daly had a strong connection to horses, being an international polo player, a county Master of Hounds, and owned a number of racehorses. It is said that during one of the races at the Irish Oaks, the Captain and Daniel bet everything, including the distillery, on a horse from Tullamore. Fortunately, the horse won so the distillery didn't change hands though I'm sure it was quite a tense race. In time, due to Daniel's hard work and dedication to the distillery, he became the owner of the distillery! That is certainly a great example of working yourself up from the bottom. Daniel was an innovator, introducing new technology, from electricity to the telephone. Their famous Tullamore DEW whiskey is also named after him, DEW being his initials. Today, the Tullamore DEW is owned by the William Grant & Sons company, which also owns a number of Scotch brands as well as other spirits. They are now the second largest distillery in Ireland, after Jameson Irish Whiskey. In September 2014, they opened a new distillery and will soon conduct everything on their own, from grain to bottle. Their first release from this new distillery, due in the near future, will be a 3 Year Old Blended Irish Whiskey. Locally, Tullamore DEW is the official Irish whiskey of the Boston Red Sox and now appears at Tully Tavern, a new bar at Fenway Park. They cannot sell their Whiskey on its own, but has to offer it in cocktails. They offer the Monster Mule, their Irish take on the Moscow Mule, which is made with 1 part Tullamore DEW, 4 parts Ginger Beer, and lime juice. The Tullamore DEW Original ($20-$25) is the only triple blend of whiskey in Ireland, blending together grain, malt and pot still whiskies. The malt is also the most dominant in this blend, providing more fruit flavors to the whiskey. In addition, after a triple distillation. it is matured, for about 4-7 years, in three different types of barrels, including Bourbon, Oloroso Sherry and old Whiskey barrels. As you can see, the number 3 is very important to Tullamore. I found this to be a light and elegant whiskey, with bright flavors of apple and citrus, spice, vanilla, and salted almonds. At this price point, it is an excellent value. The Tullamore DEW 12 Year Old Special Reserve ($45-$50) is also a triple blend, though with a higher percentage of pot still whiskey, giving it a spicier aspect. It is also triple distilled and aged in three different barrels, though most of the pot still was matured in Oloroso Sherry barrels so it has a stronger Sherry notes too. It is definitely a spicier whiskey, with notes of salted nuts, caramel, raisins and a hint of chocolate. There is more complexity to the blend and the finish is long, with a slight hint of a burn. The Tullamore DEW 15 Year Old Trilogy ($80-$85) is another triple blend, with balanced proportions, that is triple distilled and spends time in three different barrels except that it also is finished, for about three months, in Rum barrels from Trinidad. Smooth and elegant, the complex melange of flavors included some tropical fruit flavors, pleasant spice notes, hints of chocolate, and a delightful creamy mouthfeel. The finish was long and satisfying, with a rich and pleasing aspect. Highly recommended! The Tullamore DEW 14 Year Old Single Malt ($65-$70) is matured in the usual three types of barrels, but then also spends a little time in Port and Madeira casks. On the nose, there are pleasant notes of apple and tropical fruit, and the palate also presents this fruit flavors, accompanied by a complex mix of vanilla, spice and caramel, with an elegant creaminess that caresses your palate. The finish lingers for quite a time and I can easily see myself sipping this all evening. Highly recommended! 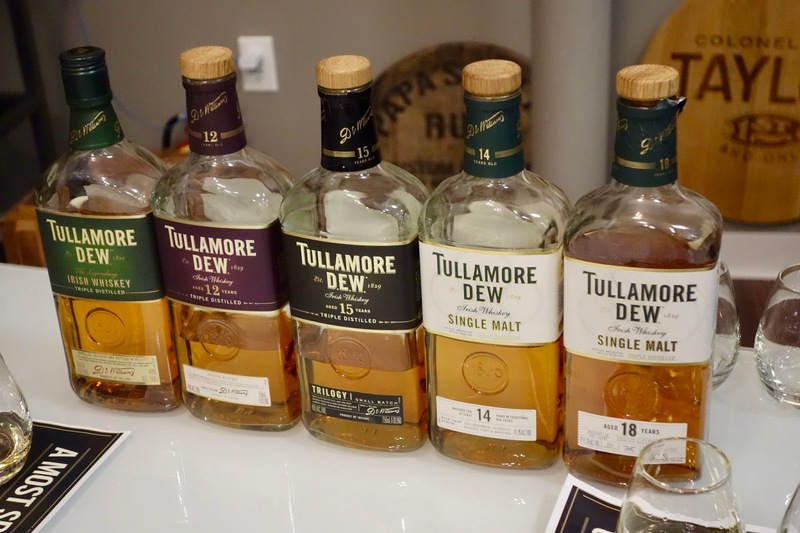 The Tullamore DEW 18 Year Old Single Malt (about $120) is going to be very difficult to find in Massachusetts as only 1 case was allotted for the state. Thus, the price could be much higher than provided. It is essentially the same as the 14 Year Old, except for the additional time in the barrel. In comparison to the 14 Year Old, it is as complex, with similar flavor notes, except it is more subtle and elegant. In addition, there are stronger notes of spice and raisiny elements. This is best, slowly sipped, savoring its more subtle complexities. Tullamore DEW produces a delicious and interesting portfolio of whiskies, from their value-priced Original to the more complex Single Malts. One of their newest projects, which should be available around October, is the Tullamore DEW Cider Cask Finish, which is finished in Irish cider barrels. This could be the first, and maybe only, whiskey finished in cider barrels. What are your thoughts on Tullamore DEW Irish Whiskey? 1) Civic Kitchen & Drink, Chef Rick Araujo and GM Sarah Lee are hosting a Spencer Trappist Ale Dinner on Tuesday, May 23, at 6pm. This is a very rare opportunity to taste a variety of unique Spencer Trappist Beer and the dinner is sure to sell out. The monks at St. Joseph Abbey, in Spencer, brew the beer themselves; it is the only certified Trappist Beer made in the USA. Civic Kitchen & Drink is honored to present Spencer Trappist Beer and celebrates this extraordinary and one-of-a-kind local brewery. Chef Rick Araujo is creating a Four Course Dinner paired with Spencer Trappist Beer. --Chinese Five Spiced Duck over a smoked gouda polenta and smothered haricot vert / Beer Pairing Coming Soon! 2) Puritan & Co. Chef/Owner Will Gilson and the Puritan team invite guests to join them at the bar for a brand new Caviar Special. Puritan & Co. is serving up this caviar special at its bar daily. Available during all regular business hours at the bar, the special includes two vodka nips served frozen on ice, 12g of Osetra caviar, and all the fixings for only $30. 3) Chef/Owner Michael Schlow, Chef de Cuisine Brendan Pelley, and the Doretta Taverna team invite guests to join them as they officially kick off patio season. On Wednesday, May 31, from 6-9pm, Doretta Taverna and Raw Bar will officially be kicking off patio season with an epic patio party featuring live music, mezze, local oysters, and more. The event will take place rain or shine and no tickets are required. 4) Chef de Cuisine Alex Saenz and the BISq team invite guests to join them on Sunday, May 28, from 10:30am-3pm, for a farmer’s market-to-table themed brunch. While the farm-to-table trend has been popping up at more and more restaurants for some time, BISq is taking the trend in a slightly different direction. Sourcing fresh produce the day before from its neighboring Union Square Farmer’s Market and beyond, BISq's fifth installment if its monthly brunch pop-up series will offer a deliciously fresh a la carte menu showcasing local fruits and veggies. Reservations are strongly recommended so please call (617) 714-3693. In a blind tasting in Paris in 2016, English Sparkling Wine defeated Champagne in two categories, tying in a third. Bubbly from England? Yes, and in a relatively short time it has been marking its mark and is now starting to reach the shores of the U.S.
We must remember that the Romans brought viticulture to England though it didn't catch on there as it did in many other countries. In the 1950s, wine making became popular in England for a time, and then again in the 1980s and 1990s. However, it is only in about the last five years that a more serious effort has begun. There is now even a university of wine-making in the country. England used to rely primarily on hybrid grapes but that has changed and now they have chosen to rely much more on traditional Champagne grapes. In 2015, England produced approximately 5 million bottles of Sparkling and Still wine, with bubbly comprising about 70% of that total. This annual total is less than 1% of their domestic consumption so it is still a very small industry. There are now over 500 commercial vineyards, occupying about 5,000 acres, and over 130 wineries. England is also exporting their bubbly to 27 countries, up from 19 the previous year. Much of their success is attributed to their chalky soils as well as their climate, which has been getting warmer due to climate change. England has a maritime climate, with slightly warmer springs and cooler summers, rather than the continental climate of Champagne, but they are actually only 1 degree cooler than the Champagne region. Essentially, England now has a similar climate to what Champagne did in the 1960s to 1980s. I recently had my first opportunity to taste some English Sparkling Wine, at a media breakfast event at Bar Boulud. Bubbly for breakfast? Why not? The event was hosted by Chapel Down, an English winery which produces a number of Sparkling and Still wines, as well as beer, ciders and spirits. Two representatives of Chapel Down attended the event, including Josh Donaghay-Spire, their wine maker, and Mark Harvey, the Managing Director, Wine. It was a fun and tasty event, and I was impressed with the two Sparkling Wines we tasted. Chapel Down's winery is located in Tenterden, Kent and their grapes are sourced from vineyards in Kent, as well as the region from Essex to Hampshire. Kent is the top region for English wineries, with Sussex in second place and Essex in third. Chapel Down's focus is the "North Downs," chalky escarpments similar to the limestone soils of Champagne. They grow grapes included Chardonnay, Pinot Noir, Pinot Meunier, Pinot Blanc (which grows very well in England) and Bacchus. There are few organic wineries in England as the high humidity makes it more difficult. At Chapel Down, their yields are very low, about 2.5 tons per acre, which is partially because they plant at lower densities, allowing them to have more canopies. Though they produced their first wines back in 1977, it has only been in the last 15 years that they have made a serious effort. For example, back in 2001, they sold only about 25,000 bottles though by 2012, they had sold about 250,000 bottles of Sparkling Wine. The winery currently produces 600K-800K bottles annually, a roughly equal split between Sparkling and Still. They see a big opportunity for bubbly and they produce at least 7 different Sparkling Wines, made by the Méthode Champenoise, and priced from 25-100 English pounds, including Blanc de Blancs, Blanc de Noir, Non-Vintage Brut, Vintage, and Rosé. Chapel Down is also very proud that "innovation is their ethos." For example, they were the first winery in England to produce an "orange" wine, a skin-contact Bacchus, and they were also the first to make a single-varietal Albarino. In 2014, they initiated a crowdfunding effort to support their winery and raised a record-breaking 2.5 million pounds in only two weeks. Their top priority right now is introducing their Sparkling Wine to the U.S., and in October 2016, they launched their 2010 Vintage Three Graces ($50) in the U.S. Currently, their bubbly can be found in Massachusetts, Connecticut and New York, and they are also looking at a possible placement on the West Coast. They are following up the Vintage with their NV Brut ($40) and will eventually release one of their Rosé Sparkling Wines ($50). Chapel Down currently exports only about 10% of their production and the U.S. is their main market. In 5 years, their lofty goal is to be on the same level as Bollinger. Josh Donaghay-Spire, the winemaker for Chapel Down, was born in Kent and originally began in the restaurant industry. In his early 20s, he decided to move to South Africa and get involved in the wine industry. He eventually spent time working in Alsace and Champagne, before returning to England and joining Chapel Down in 2010. He is extremely personable, very passionate about wine, seems to embrace innovation. The Chapel Down NV Brut ($40) is a blend of 44% Chardonnay, 38% Pinot Noir, 11% Pinot Blanc, and 7% Pinot Meunier. Most of the grapes are from the excellent 2014 vintage, sourced from vineyards in Kent, Essex, and Sussex. It was fermented in stainless steel, underwent about 80% malolactic fermentation (though most of their bubbly undergoes 100% malolactic) and spent about 18 months on the lees. It was disgorged a few months before release. With a 12% ABV, it also has about 8.5 grams/liter of residual sugar and the sulfur levels were kept low too. The Brut is made in an aperitif style and had a pleasing golden color with lots of tiny bubbles and a pleasant fruity aroma. It has a clean and crisp taste, with prominent apple flavors, hints of citrus, and a streak of minerality. An easy-drinking, yet complex, and elegant sparkling wine, this certainly would be an excellent aperitif, though it also would pair well with lots of different foods, from seafood to chicken. The 2010 Chapel Down Three Graces ($50) is a blend of 60% Chardonnay, 33% Pinot Noir, 7% Pinot Meunier. This was Josh's first vintage and it happened to be an excellent vintage as well. "The long growing season allowed for the slow development of delicate flavors and with a great balance of sugar and acidity at harvest." About 10% of this wine includes reserve wine from 2009, and there was a tiny bit of oak in that reserve wine. It was fermented in stainless steel, underwent 100% malolactic fermentation and spent about five years on the lees. It was disgorged a few months before release. With a 12% ABV, it also has about 9 grams/liter of residual sugar and the sulfur levels were kept low too. Like the Brut, the Vintage had a pleasing golden color with lots of tiny bubbles. There are fruit notes on the nose but with a touch of toast. And also like the Brut, it has a clean and crisp taste, lots of freshness. On the palate, there were tasty apple flavors and hints of citrus, but with more brioche elements and a lengthy, pleasing finish. It is more complex than the Brut, an elegant Sparkling Wine which is delicious and intriguing. It too would pair well with lots of different foods. This Vintage Sparkling Wine is only about 10% of their overall production, about 20,000 bottles. We enjoyed both Sparkling Wines with our breakfast, from scones to fresh fruit, to smoked salmon and eggs atop English muffins. The smoked salmon went best with the wines, especially the Vintage. As I've said before, Sparkling Wine is very food friendly and more people need to consider it as a pairing with dinners or even breakfast. Locally, Chapel Down's Sparkling Wines are being distributed by the Carolina division of the Martignetti Companies. These wines are now available in a number of local restaurants and I've also learned that the Wine Press in Brookline is selling these Sparkling Wines. I was impressed with the Chapel Down Brut and Vintage Sparkling Wines, enjoying the elegant, complex and clean flavors of each. If these are an example of the quality of English Sparkling Wines then I certainly need to drink more of them. Consider that the traditional Sake brewing season starts in October and it's said that the best Sake, like most Daiginjo, is made during the coldest, snowiest months. Some of the snowiest prefectures of Japan are considered to be the best regions for Sake. For example, the snowy prefecture of Niigata, with over 90 breweries, is one of the most popular Japanese regions for the production of Sake. Located in Niigata, the Hakkaisan Brewery is using the copious snowfall in a rather unique way, to assist in the maturation of a Sake. Hakkaisan Brewery, which was founded in 1922, is located in the city of Minami-Uonuma, which is nestled in a valley known as Yukiguni, Snow Country, due to its heavy snowfall. At the foot of Mount Hakkai, within Minami-Uonuma, the snow can be as much as nine feet deep. The brewery has a water pipe at the foot of Mount Hakkai, bringing in Raidensama no mizu, "spring water from Raiden," which is a super-soft water and excellent for Sake production. Raiden is the Japanese god of thunder and lightning. One of their newest releases is the Hakkaisan Snow-Aged Junmai Ginjo 3 Years ($60), which is pictured above, the pure white bottle intended to reflect the nature of pure snow. I was sent a media sample of this Sake, which certainly intrigued me when I was informed of its nature. I had some questions about the Sake, which were initially directed to Timothy Sullivan, a Sake Samurai, Certified International Sake Sommelier (SSI), and the founder of Urban Sake. Timothy is also the Brand Ambassador for Hakkaisan and last November, started a year of working at the brewery and contributing to their blog. Some of my questions, of a more technical nature, had to be forwarded to their Toji, Shigetmitsu Nagumo. "Be like snow — cold, but beautiful." The Hakkaisan Snow-Aged Junmai Ginjo 3 Years is special in a number of ways, making it a more unique Sake. First, most Sake is brewed using only a single type of rice but Hakkaisan produces a number of Sakes using two or three different Sake rices, including this Snow-Aged Sake which uses three. Yamada Nishiki, the "King of Sake Rice," is used to make the Koji, so they can "maximize the brewing characteristics of Yamada Nishiki." As the Toji feels the creation of koji is the most important step in Sake brewing, he wants to "emphasize the characteristics of Yamada Nishiki such as the pronounced aromas and softness." For brewing rice, they use a blend of about 80% Gohyakumangoku & 20% Yukinosei, with the Gohyakumangoku providing a light clean flavor and the Yukinosei providing Umami. This blend of three Sake rice types provides them the target flavors they seek. The brewing rice was polished down to 50%, which technically is the minimum rate for a Daiginjo, though this Sake is labeled as a Ginjo instead. The brewery was aiming to "apply Daiginjo-class production techniques to all levels of our sake in order to improve the overall quality of the sake that people drink everyday." Thus, as part of that intention, this Sake was labeled as a Ginjo rather than a Daiginjo. As I've mentioned before, aged Sake is rare but this Snow-Aged Sake is one of those exceptions. It is aged for three years in a fascinating place, a Yukimuro, a snow storehouse. Constructed in July 2013, this is an insulated storage room with almost 19,000 square feet of floor space. Within this space are 20 storage tanks, each which can hold 20,000 liters, and the only Sake within those tanks is that intended for their Snow-Aged Junmai Ginjo. Not all of the tanks are filled at any one time. Besides those twenty tanks, the Yukimuro is also filled with approximately 1000 tons of fresh snow! They gather the snow from the low hills behind the brewery and only need to fill it once a year. By the end of that year, there is about 1/3-2/3 of the amount of snow remaining. This snow will maintain the temperature within the storage tanks at a stable 3-5 degrees Celsius year round. There is also no need for electricity within this building, making it a more eco-friendly solution for aging. Each year, they produce about 400 Koku of this Snow-Aged Sake, which is the rough equivalent of about 10,000 720ml bottles. What does this snow aging accomplish? Some Sake, usually called Koshu, is aged but not under very low temperatures. That causes the color to change drastically, to darken so it looks more like an old Port or Sherry. It also brings out very different flavors, usually much more earthy elements. However, aging under low temperatures generally does not change the color and it seems to primarily raise the complexity of the Sake. It may also help to mellow and smooth out the Sake. The Snow-Aged Sake is a Genshu, meaning it is undiluted by water and possesses a 17% ABV. In addition, it has a SMV -1, Acidity 1.5 and Amino Acid 1.3, which won't mean much to many people except you should understand that it has a higher acidity level than similar Sake, meaning it works even better with food pairings. I shared this bottle with several friends at a dinner party, where all of the food was prepared with Sake, including tomato-bread soup, halibut, rice, and chicken wings. Everyone enjoyed the Hakkaisan and I think it worked very well with the various foods, especially considering its high acidity and rich umami. I found the Hakkaisan to have a more subtle aroma and on the palate presented an elegant, deep complexity with hints of melon and a touch of anise. It was full-bodied and smooth with rich, savory umami. A hedonistic pleasure that is extremely food friendly. It is certainly worth its price and I highly recommend it. The snow elevated this compelling Sake, providing a deeper, elemental aesthetic to it. "Kindness is like snow-it beautifies everything it covers." Sure, all of those shiny medals and brightly colored ribbons hanging on your wine bottles look pretty but I don't care about them. And I'm not the only one. I think it's safe to say that most wine writers feel the same, that the fact your wine won a handful of silver, gold or even double gold medals is basically meaningless to us. I attend numerous media/trade wine tastings, meeting many winery representatives, wine makers, winery owners, importers, distributors, PR reps and more. As I taste their wines, it's inevitable that a significant majority of these individuals will boast of the medals that their wines have won. That is when my eyes glaze over and my ears shut down. It's not something I'm going to write about and it's not something that matters to me in the least. It's a waste of your words. Consumers might be interested in hearing you talk about your medals but most wine writers I've spoken to would rather not hear about them. We would rather judge the wine on its own merits, rather than caring about how well that wine did at some wine competition. In a similar respect, we don't want to hear about your wine scores either, as they too are basically useless to us. We do want to hear about your story, about the people behind the winery. We do want the technical specifications, though some of us want more than others. We want to hear about what makes your wines unique. And we will taste your wines and decide on our own what we think about them. If any of us really wants to know about your medals and wine scores, then we will ask, but I doubt many will inquire about those. Please also consider the fact that at many of these trade tastings, our tasting time is limited so we may not spend lots of time at any one table. As such, you need to be succinct, providing us the most valuable information in a short period of time. Don't waste that time bragging about your medals when that is the last thing we want to know. You can brag about your medals to the consumers. Save your breath and please don't even mention your medals. Good things something come in small packages. The Bankgok is a small, new Thai/Vietnamese restaurant on West Wyoming Avenue, near the railroad tracks, in Melrose, that opened around mid-March. There are about five small tables, for two people, in the restaurant and they have room to put up another couple tables if they get busy. They also do take-out and delivery, though delivery may be limited to the evening hours. I've dined there on multiple occasions, mostly during lunch time, and including getting take-out one evening. Their website has little information about the restaurant beyond the necessary basics, though you will find their full menu online. Some research indicates that corporate officers are also connected to Pho & Rice in Somerville and Thana Thai Kitchen in Arlington. In the near future, I will try to speak with the owners for more background on the restaurant but for now, I'll primarily deal with their food and service. The Menu is extensive, with plenty of Thai and Vietnamese options, and is very reasonably priced, with no dish costing more than $15. The Menu categories include: Appetizers ($5-$7), Salads ($7-$8), Soup ($4), Vietnamese Pho & Thai Noodle Soup ($9-$12), Stir Fried Noodle ($10-$14), Fried Rice ($10-$14) Bun-Vermicelli ($9-$11), Rice Plates ($10), Sautéed ($11-$14), Curry Dishes ($11-$14), Bangkok Specials & Seafood Entrees ($11-$15), and Sides ($1-$3.50). They don't have a liquor license but their drinks menu includes items like Bubble Tea, Smoothies (though it appears they are not available yet), Thai Iced Tea, Lychee Juice, Vietnamese Iced Coffee, Coconut Juice, and more. It is nice that they usually bring a large bottle of water to your table, though you drink it out of a paper cup. They have about thirteen Appetizers and I've tried several of them. The Roti Curry Sauce ($7) is a Fried Scallion Pancake served with a Green Curry Sauce. The pancakes are fresh, light and flaky, and not greasy. They make an excellent vehicle for dipping into the sauce, with its tasty flavor combination of coconut, lemongrass and mild spicy heat. The Moo Pbring ($6.50) are grilled skewers of lemongrass marinated pork, accompanied by a smoked chili and tamarind sauce. These were excellent, with lots of tender, moist and flavorful pork and the sauce added some sweet & spicy elements. Forget those dry beef teriyaki skewers you get at other Asian spots. These easily put them to shame. The Gyoza ($5), which you can have steamed or pan-fried, come as either Pork & Chicken or Vegetarian, and are served with ginger soy sauce. I opted for the pan-fried Pork & Chicken and they were tasty, filled with plenty of meat, and fried just enough to add some crispness to the gyoza skin. The Sai Grog Issaan ($6) states it is "Sausages fermented Pork and Glutinous rice" but appears to be sliced sausage with lettuce, cucumbers and peanuts. The sausage was tender and spiced well and the veggies were fresh. 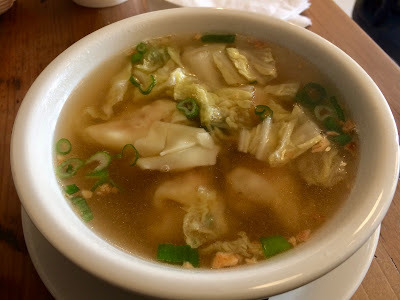 As for the Soups, I tried the Soup Hoanh Thanh ($4), which are pork and shrimp dumplings gently boiled in clear chicken broth with lettuce, onion, scallion and cilantro. You receive four plump and meaty dumplings and the broth is clean and mild. This would be especially good on a chilly day. The Pho Gar ($9) is a Chicken Noodle soup with shredded chicken, rice noodle, onion, cilantro, and scallion with aromatic chicken broth, accompanied by some bean sprouts, herbs and lime. The broth is intense with flavor and there is plenty of chicken within the soup. The noodles had a nice chewiness to them. The Mi Hoanh Thanh ($10) consists of pork and shrimp dumplings, yellow noodles, sliced pork, scallions and cilantro in a chicken broth. This is a hearty dish, with several slices of tender pork and plump dumplings. The noodles are thinner than the ones in the Pho but still had a nice texture and chew to them. There was plenty of flavor in the broth making this a very compelling dish. The Rice Plates ($10) come with Traditional Vietnamese Grilled meat (chicken, pork or beef) accompanied by steamed Jasmine Rice, fresh tomato, cucumber, sliced lettuce and their Fresh Homemade Sauce (Nuoc Cham). You can also add a Fried Egg ($2). Above is the dish with the grilled chicken and egg. Another excellent dish with plenty of tender, flavorful chicken, enhanced by the egg, and the veggies were fresh and crisp. There was plenty of rice below all of the toppings. A good value for only $10. I enjoyed a few other dishes, but which I don't have photos. The Grapao Gai Sub ($11) is stir fried minced chicken with fresh chili and basil. A spicy dish, it was very good layered over some rice. The Com Chien Fried Rice ($10) is Vietnamese fried rice with a combination of shrimp, chicken, Chinese sausage and mixed vegetables in Vietnamese chef's special sauce. Lots of flavor in this rice dish as well as plenty of meat. It tasted very fresh. The Chicken Pad Thai ($10) consists of stir-fried noodle with egg, bean sprout, turnip, and scallion in a Thai tamarind sauce topped with ground peanut. A nice choice as well. The restaurant has a special, second menu which you probably won't receive unless you are Thai. It's only written in Thai and they don't have an English translation though your server will explain it to you if you ask. You can see there are sixteen options, priced $7-$12. Fortunately, Pai Chourattana on Facebook generously provided me a translation of their menu which will help you navigate this special menu. Off this special menu, I tried Nheam Kra Dook Moo, sour pork ribs (#6 on the menu), which were accompanied by some cucumber slices and lettuce. You need to gnaw the meat off these small pieces of ribs, which have a mildly sour flavor to them. These would make for a nice bar snack. 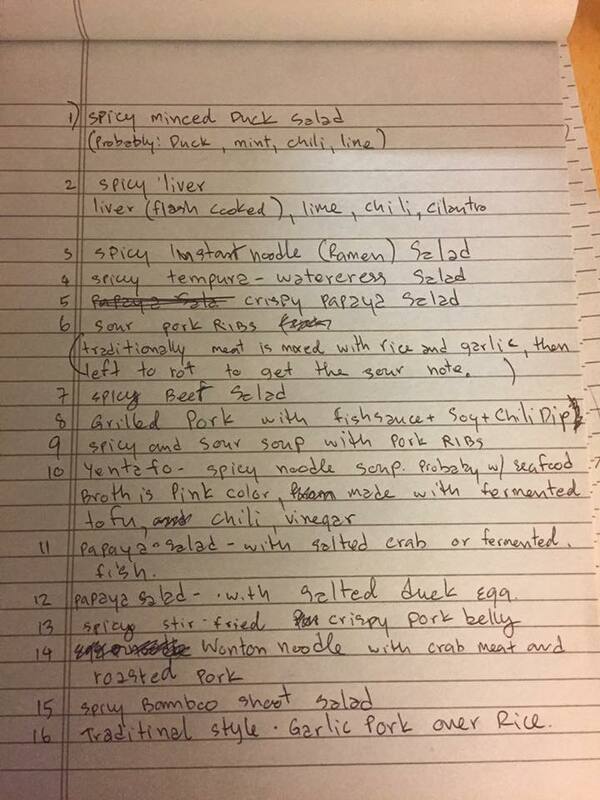 Also off the special menu, at #16, is the Garlic Pork Over Rice, which also comes with a few cucumber slices. It's a simple dish, pieces of slightly fatty pork with crisp pieces over garlic over white rice. But it is hearty and tasty, perfect for a rainy day. The Garlic Pork dish also comes with a small bowl of soup, a slightly soup broth. I'll be sure to try more items off this special menu as there are plenty of other dishes that interest me. Service is very good, personable and attentive. Overall, I've been very pleased with the quality and taste of the food from The Bangkok. It is fresh, with clean flavors, and there is enough diversity for all preferences. I've already been recommending it to my friends and I'll also continue regularly dining there. It is a welcome addition to the Melrose area.